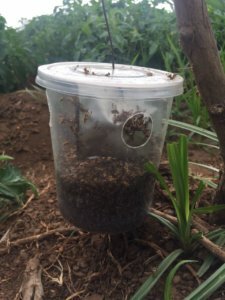 Meltrack - Kenya Biologics Ltd.
Meltrack is a lure containing an insecticide and a strong attractant for male Bactrocera cucurbitae (Melonfly) species. The block should be used in combination with a trap. Male fruit flies are attracted to the lure and die because of the insecticide inside the block. Use: Hang 10 traps per acre. Hang the traps inside your crop at about 30 cm above ground. Replace after 6 weeks.